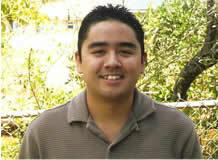 Kenneth J. Estores, Jr. was born and raised in Wahiawa, Hawaii (Oahu). He graduated from Leilehua High School in 2004. Kenneth is currently attending UH Manoa where he is studying electrical engineering. He plans to graduate in May 2008 with a B.S. degree. His interest lies in communication, control, and signal processing systems. Kenneth will pursue employment after graduation and is considering graduate school in the future. Power amplifiers are used in all communication systems throughout the world; their main purpose is to amplify signals to enable long distance transmission. The goal of this project was to design and simulate different digital modulators using Visual Systems Simulator. Variations of amplitude and phase shift keying modulators were considered. These different modulators were then interfaced with a 200W Class AB power amplifier that was designed and built by Trex Enterprises. The effects of operating the modulator in the non-linear or saturated region of the amplifier caused the modulated signal to experience a phenomenon called clipping. This effect clearly demonstrated a significant problem to the different amplitude shift keying signals when operating the amplifier in the saturated region. Based on the analyses and various trade-off parameters that are associated with RF communication systems, which include bandwidth, power, error rate and data rate constraints, recommendations for implementing different modulation schemes will be presented.